I’d like to share something with you I found helpful (among many things) at the Institute for Biblical Counseling and Discipleship’s (IBCD) Summer Conference this week, entitled “Making Peace with the Past”. Notice what is the common thread in each “bucket”: our responsibility in our response. 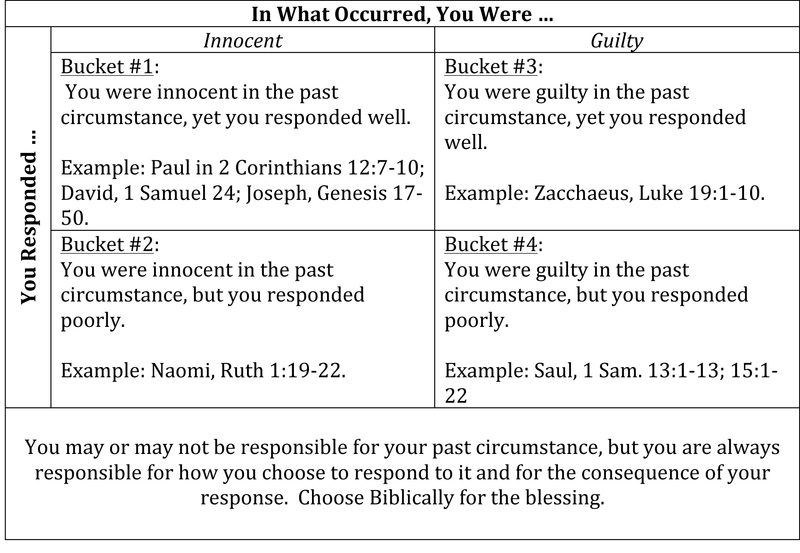 You may or may not be responsible for bad things in your past, but you are always responsible for how you then and now respond to them Biblically. Beloved, let us take our responsibility as individuals, families, and a church for being holy, that is, godly, that is, Christ-like, in how we respond to everything and everyone. And let us benefit in the blessed fruit of such progress in our sanctification together.